LOS ALAMITOS, Calif., (Jan. 2, 2017) – Katella Senior Living Community is proud to announce that they have been selected as one of the 2018 Best of Assisted Living Award Winners on SeniorAdvisor.com, the largest ratings and reviews site for senior care and services in North America and Canada. SeniorAdvisor.com is in their fifth year of hosting the Best of Senior Living Awards. 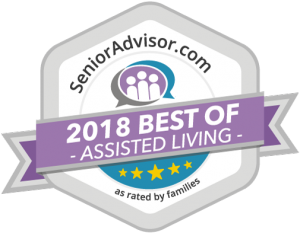 SeniorAdvisor.com’s Best of 2018 Award winners represent the best of the best of in-home care, assisted living, and other senior living providers, based on the online reviews written by seniors and their families. This exclusive designation honors the top one percent of senior care providers across the United States and Canada. Katella Senior Living Community is one of the only winners in Los Alamitos, Calif., and regularly receives exceptionally positive reviews from their senior customers and their families.